Forests (often ± open), fields, meadows, river banks, conifer swamps. Ordinarily quite distinct from A. cylindrica, although there may be an exception to any of the characters in the key. Occasional plants may have white flowers as large as 3–3.5 cm across, resembling those of A. canadensis (from which this species is easily separated by its petioled cauline leaves). These are A. virginiana var. alba (Oakes) Alph. Wood, although smaller-flowered plants are also included here, based on their smaller anthers less than 1.2 mm and narrower heads mostly 8–10 mm across (A. riparia of some floras). This entity is more northern and ranges throughout the Upper Peninsula and into the northern third of the Lower Peninsula. 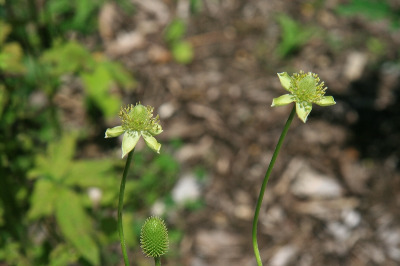 Variety virginiana, with anthers mostly longer than 1.1 mm and heads 11–14 mm in diameter, ranges from the southern border of the state throughout the Lower Peninsula but is less common in the Upper Peninsula. Not all specimens, however, can be easily assigned to a variety. MICHIGAN FLORA ONLINE. A. A. Reznicek, E. G. Voss, & B. S. Walters. February 2011. University of Michigan. Web. 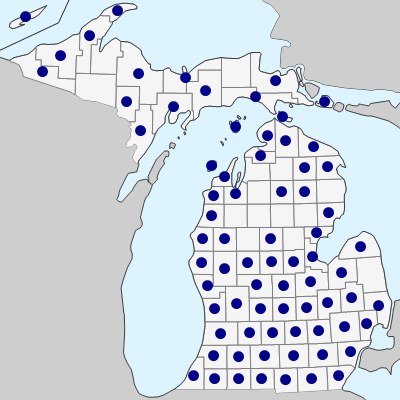 April 21, 2019. https://michiganflora.net/species.aspx?id=2361.